1950’s. Together with Borje Larsson, a physicist, Leksell built the first Gamma Knife unit in Sweden in 1968. Since that time, this non-invasive technique for the treatment of brain tumors and vascular malformations has enjoyed incredible success. Radiosurgery differs from conventional radiation therapy in several respects. With standard external beam radiation therapy techniques, tumors and much or all of the surrounding brain are treated to the same dose of radiation. The radiation dose is given in small increments over several weeks to allow normal brain tissue to recover from its effect, while tumor tissue is less likely to recover. Ultimately, the brain can absorb a maximal dose of radiation, beyond which no further treatment is advisable. There is increasing evidence that over long periods of time, high doses of radiation are harmful to normally functioning brain. The technique of Gamma Knife radiosurgery treats only the abnormal tissue, in a single session, without significant radiation to adjacent brain. Professor Leksell’s concept has proved to be a true advance in the treatment of intracranial disease. 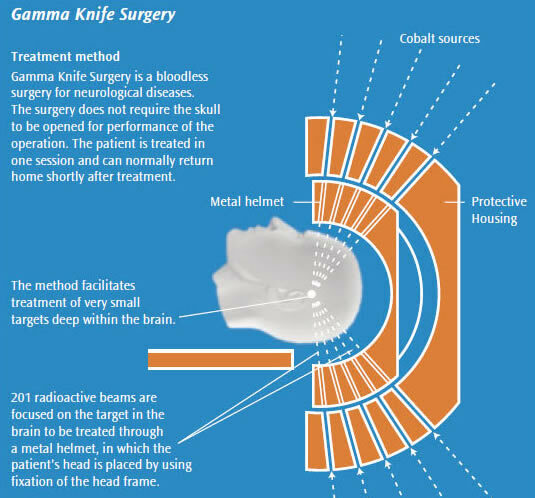 How is Gamma Knife Radiosurgery Performed? Radiosurgery is carried out through the cooperative efforts of a neurosurgeon, radiation oncologist and physicist. Your initial consultation will help you determine if GK radiosurgery is appropriate, effective and safe for your problem. Every patient should have information about all applicable treatments, the expected outcomes, risks, costs and the natural/ history of the untreated disease process. Early in the morning we fix a lightweight aluminum frame to the head using local anesthesia and intravenous, conscious sedation. This procedure is rapid and well tolerated. In fact, most patients have no recall of frame placement. The frame remains in place until the end of treatment later in the day. The computer software reduces the treatment plan to a list of simple instructions to guide the gamma rays to the target. The patient’s stereotactic head frame is fixed within the secondary collimator according to these instructions. Then the secondary collimator is merged with the primary collimator for treatment. Usually several shots are used to cover the entire target volume. Total treatment time varies from 45 minutes to 1 ½ hours. Following treatment, the frame is removed and patients are observed overnight or are discharged home. There are almost no initial effects of radiosurgery. Local pain in the scalp responds to simple, oral pain medication. Long range effects after many months include swelling within the adjacent brain, which may cause symptoms such as headache and neurological disturbances. Almost always this swelling is treated with oral steroids and is self-limiting. Permanent cranial nerve dysfunction causing double vision, facial numbness, weakness, hearing loss, visual loss (depending on the site treated) is rare with modern gamma ray doses.